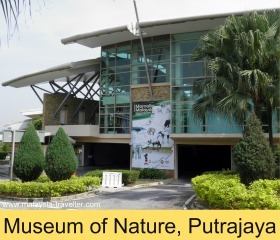 The Natural History Museum (also known as the Museum of Nature or Muzium Alam Semula Jadi) is located in a modern two storey, glass-fronted building in Precinct 15, Putrajaya. It opened to the public in February 2010. The website indicates that the museum is intended to collect, document and exhibit Malaysia's natural heritage such as plants, animals, rocks, minerals and fossils. 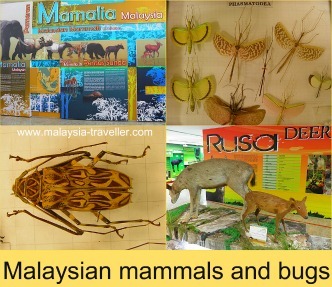 It contains, on the ground floor, an exhibition on Malaysian mammals while upstairs is temporary exhibition space and a small room containing display cases full of moths, butterflies, beetles, spiders and other bugs. The mammal exhibition features, suspended from the ceiling, a 40 foot long skeleton of the Bryde's Whale which was washed ashore in Labuan in 2005. Apart from the whale, the museum focuses on mammals which can be found in Malaysia, although rarely, since many are on the brink of extinction or at least endangered. There are stuffed examples of each animal together with displays providing facts and trivia relating to the species. The information content provided in the museum is light and would be well suited for school trips of primary or younger secondary level children. Stuffed animals include tigers, a baby Asian elephant, the Sumatran Rhinoceros, Malaysia Sun Bear, Mainland Serow, deer, primates, otters, a pangolin, squirrels and rodents. I have never been a big fan of stuffed animals (the eyes never look realistic) but it is probably the only way that most of us will ever be able to inspect these fine creatures up close. The insect room upstairs contains some traditional looking display cases with impressive collections of coleoptera (beetles), araneae (big hairy spiders), phasmatodea (stick and leaf insects), lepidoptera (butterflies and moths) and other creepy crawlies. 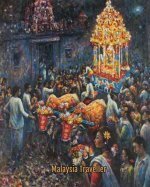 I suspect some of the exhibits in the museum are quite old and may have been moved from other museums in Malaysia. Special exhibitions are held periodically in the temporary gallery space. A photo exhibition had just finished at the time of my visit. Not much to see but if you like stuffed animals and you have half an hour or so to kill in Putrajaya it might be worth the entrance fee. The insect exhibits include some specimens which are seldom seen. Better to go when they have an additional temporary exhibition to get better value for money. Suitable for school trips. Closed on the first day of Hari Raya Aidilfitri (Eid Al Fitr) and the first day of Hari Raya Aidiladha (Eid Al Adha). Malaysian Citizens: RM2 for adults and children above 12. Free for children in school uniform. Non-Citizen: RM5 for adults and children above 6. Jalan Diplomatik, Presint 15, Putrajaya. There is ample free parking in the basement of the museum building. Click here to see the Museum's Official Website. 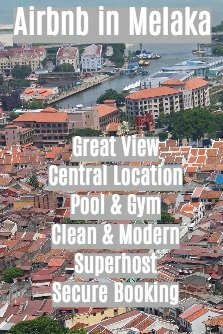 Click on the Agoda advert below for a selection of nearby Putrajaya hotels at discounted prices.